Where’s the community’s focal point? It’s the railway station. Two sleeps until the election. Apart from trying to get citizens out to a public meeting, where in the neighbourhood is the best place to meet as many people you can, face-to-face? Judging from what the politicians and lobby groups have been up to, it’s the railway station — on weekdays, at least. 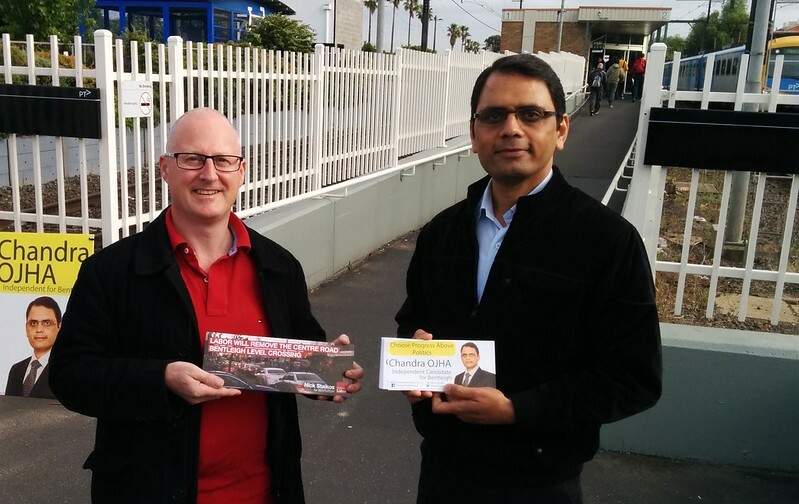 I’ve lost count of the number of flyers I’ve been handed at Bentleigh station over the past few months. Undoubtedly it’s due to being in a marginal seat. The political parties and one of the independents, as well as various unions and lobby groups (including one supporting national parks, and also Public Transport Not Traffic) have been prominent at the station in the last few weeks. Mostly they are in the morning. It’s easier to hand out flyers as you get a steady stream of people, and if the train isn’t imminent, they can stop for a minute to ask questions. In the evening few people want to linger; they’re keen to get home. Plus it’s harder to hand out to scores of people arriving in a burst, followed by minutes of nobody going past. Chalk one up for the trains. Cleverer people than I might ponder if this helps skew policies. As the Liberals’ fake commuter newspaper shows, it certainly helps influence campaign literature. You’re certainly unlikely to have a face-to-face encounter with politicians and their supporters while driving your car. Sadly those people who are unable to use trains because suburban connecting buses are so poor will also miss out. On the weekends the campaigners tend to be elsewhere in the shopping centre, though sometimes at the station. The advantage for them of street shopping centres is I doubt they’d ever get permission from a Westfield or Gandel to set up in Chadstone or Southland. 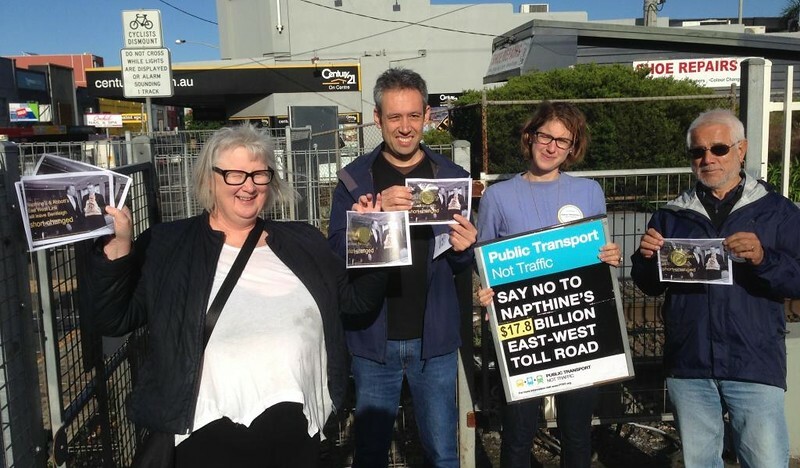 Today's station flyer: "@PTNotTraffic: Pork barrelling for public transport in #Bentleigh! #VicVotes #FreeChocolates pic.twitter.com/VxQkQthCwY"
PS. On Monday the PTUA put out its election scorecard. If you’re interested in public transport issues, and they’ll influence your vote, check it out. I think the prize goes to your son for his comment about Southern Express not stopping at Southland. Ha! Re: The Greens saying they will increase seats on PT. The Dubai Metro has a gold class carriage where the tickets cost double the price of a normal carriage. But it would surely get people out of their luxury cars if they know they dont have to share an overcrowded carriage with unwashed commoners. of course, they are not permitted to hand out political material or canvas on station property so I hope they were on the public pavement. This rule is frequently flouted at Hawksburn station by the two major parties – drives me nuts. 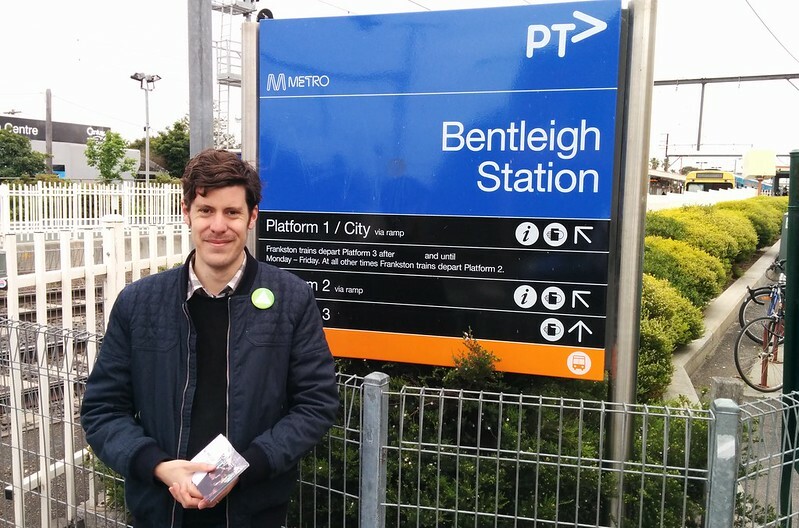 At Bentleigh I haven’t seen them go up the ramp (with perhaps one exception); they all stay at the street end next to the boom gates, and are nowhere near as annoying as chuggers, who regularly are permitted on the concourse at CBD stations. Threatening to remove a level crossing seems like a very ambiguous message. Remove it, and replace it with a bridge, or remove it, and replace it with a three mile detour. Or in Sydney’s case the ferry wharf. John Fahey some years ago at Cremorne Point staked out the wharf and shook hands with everyone, including me staying with friends.